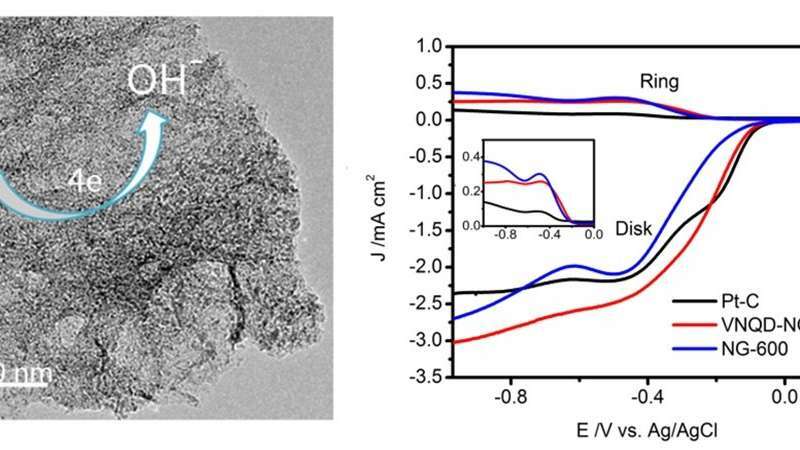 The as-prepared VNQD-NG possesses numerous zero-dimensional (0D) VN quantum dots (QDs) with the sizes of 3?6 nm anchored homogeneously onto the surface of nitrogen-doped graphene, affording considerable structural edges and defects as active sites for ORR. Moreover, the VNQD-NG nanosheets can simultaneously construct a three-dimensional (3-D) porous architecture to maximize the exposed active sites and provide sufficient electron transport pathways during ORR. Researchers executed cyclic voltammogram (CV) measurements in an aqueous 0.1 M KOH solution to investigate the ORR characteristics of VNQD-NG samples, reflecting a prominent electrocatalytic activity of the VNQD-NG for oxygen reduction. Chronoamperometric measurements show that a strong current response occurs at Pt-C catalyst when 3 M methanol was injected in oxygen-saturated solution, whereas the VNQD-NG maintains a stable current without any distinct response. Apparently, the VNQD-NG hybrid exhibits a high selectivity to methanol in the alkaline electrolyte, tolerance to crossover effects caused by fuel molecules permeating through the polymer membrane. Researchers also conducted the rotating ring-disk electrode (RRDE) measurements to verify the ORR electrochemical kinetics of VNQD-NG, displaying a comparable ORR onset potential to that of Pt-C catalyst, and higher electron transfer number (n) and kinetic-limiting current density (Jk) than that of commercial Pt-C and other non-Pt catalysts. The current-time (i?t) choronoamperometric response for VNQD-NG reveals a quite low attenuation of 77 % after 30 000 s, which provides further evidence that the stability of VNQD-NG is superior to that of commercial Pt-C (60 %). VNQD-NG exhibits high electrocatalytic activity, high selectivity and long durability for ORR, better than commercially available Pt-C. These achievements could provide an extension of developing various other 3-D porous metal nitride quantum dots onto graphene for broad applications in sensors, catalysis, and other electronic devices.